"they're not a big museum, they're a MAMMOTH museum"
The woolly mammoth (Mammuthus primigenius), also called the tundra mammoth, is an extinct species of mammoth. This animal is known from bones and frozen carcasses from northern North America and northern Eurasia with the best preserved carcasses in Siberia. This mammoth species was first recorded in (possibly 150,000 years old) deposits of the second last glaciation in Eurasia. They were derived from steppe mammoths (Mammuthus trogontherii). It disappeared from most of its range at the end of the Pleistocene, with a dwarfed race still living on Wrangel Island until roughly 1700 B.C. also called the tundra mammoth, is an extinct species. It disappeared from most of its range at the end of the Pleistocene era (10,000 years ago), with a dwarfed race still living on Wrangel Island until roughly 1700 B.C. Carved by renowned Northwest artist Eddie Lee. Each item comes with Certificate of Authenticity, with his signature in permanent black pen "EL". 10,000 years old, carving new. #WM-100-1 A PREMIER CARVING - Genuine woolly mammoth TOOTH from Alaska that has been CARVED into a scene with a woolly mammoth being hunted by two hunters with spears; displayed on a polished wood stand; tooth measures 9-3/4" long, 4-3/4" tall, 3-3/8" thick; overall length with base is 10-1/2" long x 7-1/2" tall x 5" thick. Heidi's Favorite. Single woolly mammoth carved from fossil walrus ivory (and walrus ivory tusks) displayed on fossil walrus jaw bone; jaw measures 10" long x 3-3/4" wide x 1-1/4" thick; carving itself is 5" long x 2-1/2" tall x 1-5/8" wide. Mother and baby woolly mammoth carved in fossil whale bone (walrus ivory tusks) displayed on fossil walrus jaw bone. Two fighting mammoths carved in fossil whale bone (walrus ivory tusks) displayed on fossil walrus jaw bone. Two fighting mammoths measures the same: 4" long x 2-1/4" tall x 1-1/4" wide. Triple sperm whales in mammoth ivory on narrow wood base. Measures 4-7/8" long x 1" wide x 2-5/8" tall. Detailed eagle in mammoth ivory (carved front & back), comes on small black plastic stand, otherwise does not stand by itself. Measures 2-3/4" wide x 7/8" tall x 1/8" thick. Detailed mammoth mama & baby in mammoth ivory on mammoth ivory tusk slice base. Measures 2-1/2" long x 2-1/8" tall x 5/8" thick. Woolly mammoth (walrus ivory). Measures 2-1/8" long x 1-3/4" tall x 7/8" wide. Woolly mammoth (fossil bone, fossil mammoth ivory tusks) on wood base. Measures 2-3/8" tall x 2-3/4" wide x 5/8" thick. on oak wood bases. Carved in Bali. Sold as a pair. Woolly mammoth, moose antler. Tusks are carved of mammoth ivory. Excavated on St. Lawrence Island by Native Eskimo Yup'ik. Solid, stable piece. Great specimen. Considered "mineralized" at 10,000 years old, are solid enough to be carved or scrimshawed. Many have the rough outer "bark" that makes it resemble a tree branch but believe it, it's all ivory! 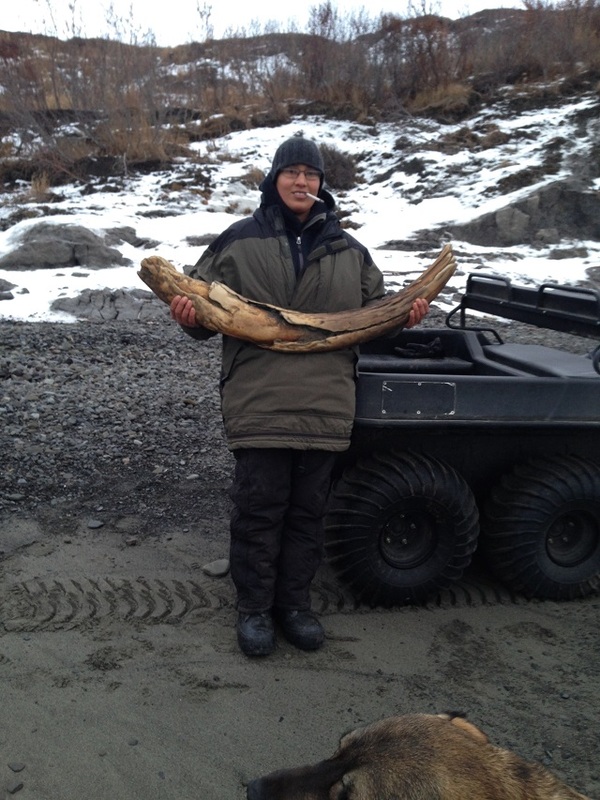 Photos of the big woolly mammoth tusk we acquired from a retired teacher now living in Chicago. She acquired it while she was teaching in Alaska for 13 years. It measures 8' 9" long (following the curvature of the tusk), weighs 59.5 pounds, has a 16.5" circumference around the big end, 5" diameter across the end. It has been restored. Close up photos of other side of tusk, from tip to large end left to right. 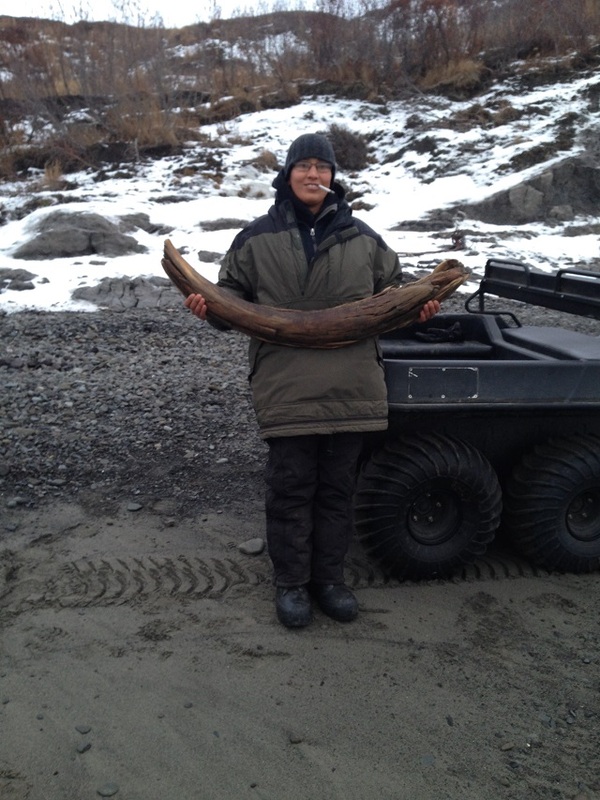 This second, smaller tusk we acquired also from the retired teacher in Chicago. It is completely natural and un-restored. Measures 58" long (4' 10"); 3" diameter on end, 12" circumference on end, weighs 17 pounds. from a Native Eskimo in Unakaleet Alaska in 2014, found on the shore. LOOKING FOR MORE MAMMOTH IVORY STUFF?